The Rheem Performance Line. Exclusive to the Home Depot! A 40 gallon electric water heater providing an ample supply of water to households with 2-4 people. This model has a 6 year limited tank and parts warranty plus a 1 year in home labour warranty. A patented magnesium anode rod design incorporates a special resistor that protects the tanks from sediment, providing longer tank life. This unit comes with two 3000 watt elements and an automatic thermostat which keeps the water at the desired temperature, providing fast hot water delivery. Requires 240 volt electricity (a 20 amp breaker, with 12 gauge wire from the panel). Also available in a BC compliant model. Two 3000 watt elements for fast water temperature recovery. GE 40 Gallon Electric Water Heater. 12 year tank & parts limited warranty, 1 year full in-home service warranty. Factory installed T & P valve. Energy cutoff switch (ECO) cuts off power in excess temperature situations. Automatic thermostat keeps water at desired temperature. 4500 watt resistored, stainless steel double elements. Requires 240 volt electricity. The smartest, quietest and most efficient hybrid water heater on earth features a heat pump design making it 4x more efficient than standard electric water heaters. Smart Rheem 80 Gallon Hybrid Electric Water Heaters feature integrated Wi-Fi connectivity for important mobile alerts, like Water Leak Detection for potential added savings. Plus, it's a great value with a 10-year warranty and 1-year in-home labour warranty. Rheem Marathon 50 gallon water heater with exclusive lifetime tank warranty. The polybutene design makes the tank impervious to corrosion, and eliminates the need for an anode rod (preventing sulphur odors). Perfect for rural areas, well applications, and areas with very hard water. Foam to floor insulation for high efficiency and light weight for ease of installation. 240 volt electricity. 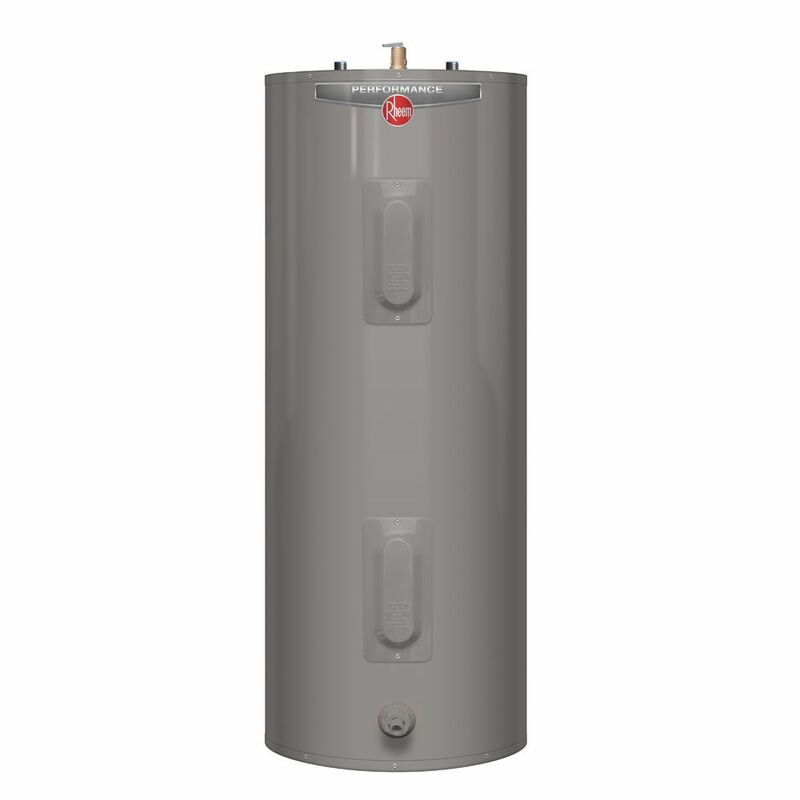 Rheem Performance 40 Gal Electric Water Heater with 6 Year Warranty The Rheem Performance Line. Exclusive to the Home Depot! A 40 gallon electric water heater providing an ample supply of water to households with 2-4 people. This model has a 6 year limited tank and parts warranty plus a 1 year in home labour warranty. A patented magnesium anode rod design incorporates a special resistor that protects the tanks from sediment, providing longer tank life. This unit comes with two 3000 watt elements and an automatic thermostat which keeps the water at the desired temperature, providing fast hot water delivery. Requires 240 volt electricity (a 20 amp breaker, with 12 gauge wire from the panel). Also available in a BC compliant model.